Share your product or service with thousands of qualified leads at the 2019 NRPA Annual Conference on September 24-25 in Baltimore, MD! The NRPA Annual Conference is the largest gathering of park and recreation professionals in the world, and the best event for companies to showcase their products and services to thousands of people with purchasing power from the park and recreation field and beyond. It only comes once a year, so don't miss this opportunity! Play a role in their agency's purchasing process. Spend time shopping the Exhibit Hall for products and services. Are at the management level or higher in their profession. See the Exhibit Hall as a valuable part of the Conference. It's time to reserve your booth space for the 2019 NRPA Annual Conference to be held September 24 - 25 at the Baltimore Convention Center in Baltimore, MD. **NRPA does not release an attendee or membership list directly to your company. We provide the list to a mail house that you send your marketing materials to for distribution. Companies will be able to send emails for the pre and post show attendee lists through our third-party vendor for an additional fee. Email campaigns will not be available for the membership list. Any costs associated with sending direct mail marketing or email campaigns is at the expense of the exhibitor and is not included in the Elite Exhibitor package fee. ***Limit to 6 additional tickets per company. Sunday, September 22: 8:30 a.m. - 4:30 p.m.
Monday, September 23: 8:30 a.m. - 4:30 p.m.
Tuesday, September 24: 10:30 a.m. - 4:00 p.m.
Wednesday, September 25: 10:30 a.m. - 3:00 p.m.
Wednesday, September 25: 3:00 p.m - 9:00 p.m.
Thursday, September 26: 8:30 a.m. - 4:30 p.m.
To learn more, contact Lindsay Shannon at exhibits@nrpa.org or 703.858.2178. 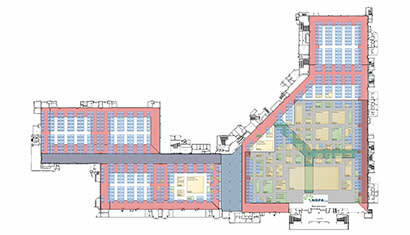 Browse the exhibit hall floor plan. Find everything you will need to make your booth arrangements.